Astaxanthin Market size is estimated to surpass USD 800 million by 2024; according to a new research report by Global Market Insights, Inc. Substantial growth in the cosmetics industry coupled with rising awareness about the health benefits of the product will primarily drive astaxanthin growth over the forecast timeframe. Increasing demand for anti-ageing creams and other supplements pertaining to geriatric population across the globe will further escalate product penetration. Provision of various benefits such as improved vision and brain health has resulted in improved product sales thus, propelling the astaxanthin market growth. The product is highly used as a key ingredient by the various cosmetics manufacturers and spa owners in their therapies and products due to its anti-oxidant and skin-friendly properties. Moreover, astaxanthin has witnessed extensive usage in animal feed applications, especially in aquaculture over the past years. However, certain factors such as excessive manufacturing costs and product adulteration probability may hamper the market growth. Consistent technological advancements in the natural astaxanthins manufacturing process lead to high quality yield with lesser wastage. Extraction, drying, and cultivation is widely adopted techniques preferred for optimal resource utilization. Microalgae cultivation has gained traction in the astaxanthin market. Highest preference towards this technology is credited to its advantages such as a considerable reduction in agricultural residue and prevention from microbial contamination. These advancements will induce immense potential to the industry size over the forecast timeline. Animal feed dominated the overall application demand, crossing 40% share in 2016. The product is highly used as a key ingredient in aquaculture and livestock. Various regulatory bodies across the globe are continuously supporting the aquaculture, further strengthening the industry penetration. Dietary supplements will exhibit 4.2% CAGR owing to rising demand for natural resourced astaxanthin. Cost effectiveness along with easy availability across the globe will further drive the segment’s growth. Provision of cardiovascular benefits and rapid pain relieving are other factors positively impacting the industry. Astaxanthin market from a synthetic source will dominate the consumption with more than 55% share by 2024. High usage of animal feed applications due to its high suitability will primarily contribute towards the revenue generation. Its adoption in aquaculture for providing pigmentation to fishes and cost effectiveness will further support the industry dominance. Naturally sourced counterparts are likely to witness highest CAGR from 2018 to 2024 owing to shifting consumer preference towards sustainable and environmentally friendly products. This shifting preference can be attributed to the provision of the benefits such as better pigmentation in animal feed and various health benefits for human beings. Asia Pacific astaxanthin market led the regional share and is projected to surpass 150 tons demand by 2024. Large population across the region with deficiency of nutrients along with the presence of leading industry participants, including BGG will further support the regional dominance. 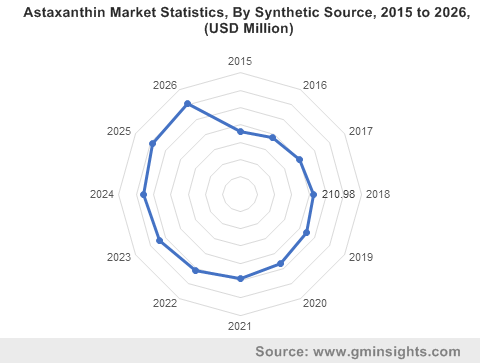 Astaxanthin market from North America will grow significantly, witnessing around 3.5% growth over the next seven years, primarily owing to rising consumer awareness regarding its health benefits. It is attributed to the presence of various organizations such as Natural Algae Astaxanthin Association that are responsible for creating awareness about its functional properties. BASF, BGG, INNOBIO Ltd., Cardax, Nippon Oil & Energy Corporation, and Fuji Chemical company are among the major players in the global astaxanthin market. Business expansion is among the key strategies implemented by the competitors to strengthen their customer base. For instance, in March 2016, BGG announced the spinoff of its astaxanthin production into a new subsidiary, Algae Life Sciences to obtain an organic astaxanthin certification. Algatech, Mera Pharmaceuticals, Divis Nutraceuticals, Otsuka Pharmaceutical Co. Ltd., and Contract Biotics are few other prominent industry participants.